Last week was a pretty big week for flexible displays. The SID 2014 conference gave out some awards and saw some great new ideas come to light, then the University of Akron popped onto our radar with a new transparent display technology of their own, which promises a lower cost and no more cracked screens! Cracked, smashed and shattered displays have been a nuisance to many users. Requiring a costly and problematic repair, if repair is even possible, a severely cracked screen could be the end of a device. Users take precautions, like installing a rugged OtterBox case, but accidents still happen. 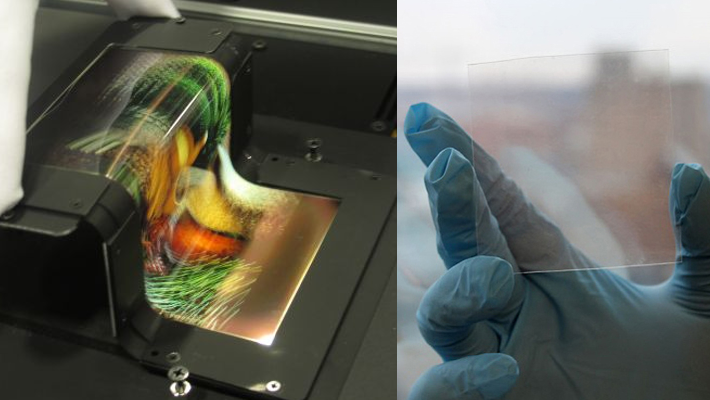 Most current displays are made out of glass. A very popular, and very effective offering is called Gorilla Glass, which is up to its third rendition. This is the glass that makes up the display for two out of my three active devices. My Moto G is only a couple months old, but my Nexus 7 has had no protection for over a year, with no signs of wear or damage. Since most displays are made of glass, they tend to shatter when they suffer an impact, especially on an edge. The new screen technology out of the University of Akron is, essentially, a transparent electrode. A full layer of these electrodes creates a see-through and flexible film that can be used as a substrate in the development of touchscreen displays. The scientists promise that it will bring an end to shattering displays. Head on over to my post on Android Authority if you want more details. The main alternative to glass for displays is to make a plastic screen. Plastic screens do not break and shatter as easily as glass, but they are very susceptible to scratches. If you had an older cellphone for any amount of time, I'm sure you had notice the 'fogging' of the display after a layer of small scratches develops, and that was before they were touch screens. I mentioned the Society for Information Display (SID) 2014 conference. They handed out two awards each in three categories this past week. Samsung took a gold award for Display of the Year for their 5.68-inch FHD curved AMOLED display. The LG G Flex took gold in the Display Application of the Year category, rocking its 6-inch curved display. What we thought was more significant out of the SID 2014 academic conference, came from the Nokia camp. Teamed up with their partners, Nokia showed off a flexible, let's call it bendable display. They got it up to 720p resolution at 5.9-inches, and it can bend to a 2mm radius. There was some dispute that this was possible, and that the supporting images showed nothing close to 2mm. Until a feasible flexible phone design and materials can be created to fully utilize a bendable display, there is no point arguing. Details on these three items can be found in my Android Authority post on the subject. It is interesting and great to see such enthusiasm for flexible displays, I find they very interesting and can't wait to have one in hand to play with. Are you looking forward to flexible devices, or do you think this is just a gimmick?